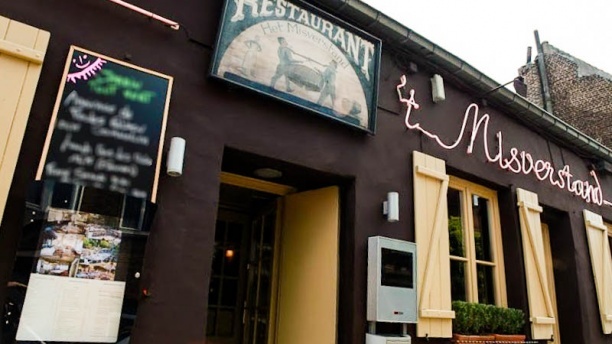 LOCATED IN UCCLE, 't Misverstand stands right at the intersection between Belgian and French cuisine. OUR TRADITIONAL DISHES (grey shrimp croquettes, Tartare and French fries and other musts) are served in a typical Belgium atmosphere. THE GARDEN IN THE BACK can accommodate up to 120 guests. Possibilities to organise an event. After being customers for a few years we feel the main menu could be a little updated with more choice. The daily lunch is excellent value and always good. The booking with discount applies only for combinations : dish+ starter or desert. Decent food but overpriced! 4€ an espresso is excessive.. Thank you very much for the nice welcome and the efficiency of service. We really enjoyed the quality of the food. We were offered a last drink at the end of the meal, which was also very nice ! Excellent food, friendly service excellent value ! Bonne viande et bon service. Le cadre de la terrasse est plus sympathique que l'intérieur. Cadre et service tres bien. Très bon accueil. On a mangé une fondue bourguignonne à 3 La viande était délicieuse. C'était super sympa. Plein d'autres plats à découvrir. À refaire surtout quand il fera beau car il y a une magnifique terrasse. As always a very pleasant experience and very welcoming staff. This is not to say the food is not good but for me it is too expensive even after the 30% the the fork discount . Excellent food: the prawns and the steak were brilliant. Great atmosphere and the staff was also very friendly. We had a great time and will definitely return. Only downside: one of our friends was vegetarian and the choice for him was very limited.